Council tax bills from Worthing Borough Council look set to rise by 2.8 per cent – 12p a week on average. The increase would see the borough’s portion of a Band D bill rise from £231.30 to £237.78 a year and add £249,510 to the council’s coffers, balancing its budget for 2019/20. Elizabeth Sparkes (Con, Offington) told a town hall meeting she did not want to set the increase any higher, saying she was ‘mindful of the financial pressures facing Worthing residents’. One point adding to those pressures was the announcement from the Sussex Police and Crime Commissioner that their portion of the council tax bill would rise by 14.5 per cent – £24. A report put before the Worthing meeting had predicted a £12 increase leaving one councillor to declare that she was ‘horrified’ by the final amount. The meeting was told that, with government funding continuing to reduce, the council would be more reliant on council tax and business rates, as well as its investment strategies. Those strategies included investment in commercial property and temporary housing, as well as the in-house development of online services. The report laid out plans to take on extra staff – including an apprentice – for both, as well as a senior planning officer to support the planned development of sites such as Union Place and Decoy Farm. Kevin Jenkins (Con, Gaisford) said there would be criticism of the proposals from some people, no matter what the council chose to do. He added: “It would be wrong if we were to purely set the council tax in Worthing based upon what others are doing. Edward Crouch (Con, Marine) said: “I think we’re in a pretty exciting time in the borough with a number of major projects that are coming forward. “Our residents don’t expect us to just stand still and cope. They want our town, they want our residents too, to thrive. 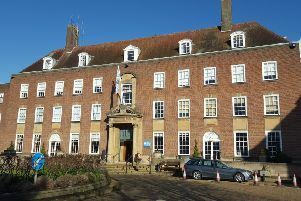 The final decision about the council tax rise will be made at a meeting of the full council on February 26.